In October of 2012, I took a refreshing trip to Iceland. Six days of this holiday were with a small group hiking tour. From Snæfellsnes to Jökulsárlón, we hiked, overnighted in simple lodges and drove. Our guide Anna brought along a new CD, the debut album of young Icelandic singer-songwriter Ásgeir Trausti. As I mentioned back in March 2013, we must have heard this album 50 times at least. After the tour, I bought a copy of "Dýrð í dauðaþögn" to take home to Toronto. I guess that album really imprinted on my brain over the six days in that van. I especially remember half dozing, half watching the rainy landscape east of Vík slip past to the strains of 'Heimförin'. Since 2012, it has probably been the most-listened-to album for me. I particularly like to play it while I'm at work. There's a reason: the main part of my job involves reviewing technical reports and scrutinizing maps. Ásgeir Trausti's music soothes me and keeps my spirit buoyed up while the Icelandic lyrics do not interfere with the technical English I'm reading (I prefer anything but English vocals while working). His voice is so lovely that I'm completely fine not to understand a word he sings. Being entirely out of touch with the music scene, I was caught off guard when a North American tour was announced for Ásgeir, including a show in Toronto! The concert was a couple of weeks ago. I get out of the office tower only about three days a year but by pure luck, I had a work meeting across from the venue on the day of the concert. I could see that a tour bus was parked in front of Lee's Palace so I took a walk past and I spotted the whole Ásgeir Trausti Band out on the street. This was my opportunity to say, 'Hello, welcome to Toronto, very much looking forward to the show!' However, I did not. I stood there in freeze mode. I could not manage so much as 'hi' when the group walked past me and then back again a few minutes later when I was still standing in the same spot on the pavement, trying to work up some courage. Opportunity missed, shyness to blame. I was extremely frustrated with myself. Since I had found out about the artist more or less at the source, I had no idea how many other people in Toronto knew of Ásgeir and would show up to see him that night. I got there early. Yes, I am the kind of person who goes to a concert alone and stands at the front centre. I think the venue ended up close to capacity (~500). The opening band was Low Roar. I had not heard of them before but their cinematic synth sound was captivating. I've been listening to their album '0' a lot since that night. Then it was time for Ásgeir and his band to perform. Key words: flawlessly clear vocals, exquisite acoustic guitar, earnestness, dreamy layering, uplifting harmonies. As a crowd, we were enthralled. To my right were several people singing out every word of every song in Icelandic, to my left was a young man who was full-on weeping for the whole show. It was not a long performance, which is to be expected from an artist who has released just one album of songs so far (technically two albums if you count the 2013 version - the same track list but with English lyrics). No question, though: Toronto loves Ásgeir. 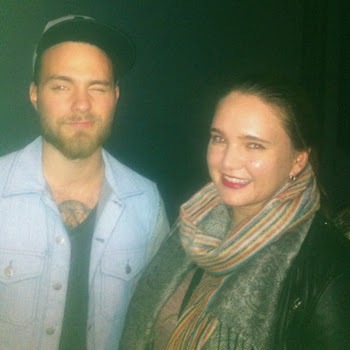 Though a convoluted sequence of events, I got a second chance to meet Ásgeir after the concert. Once again, I was short of words. I should have told him about how I was introduced to his music, or even mentioned that Nirvana had played Lee's Palace back in 1990 (Ásgeir and his band had performed a Nirvana cover that night). I could manage only to introduce myself and pay him a forgettable compliment. He was exceedingly low key and I suspect he might be a shy person, too. Anyway, I got a quick photo (the back alley lighting was not ideal) and then I ran away before I could become too star-struck again. I was really happy to have this quick moment, though! If you have not heard Ásgeir Trausti, here are three tracks from his YouTube page to give you a flavour. These English versions are still strange and new to me but I am getting used to them! Enjoy. Some of Ásgeir Trausti's music is available from iTunes as 'Ásgeir'.